Are you known by all your friends as the punctual one? Can you manage your schedule down to the minute? 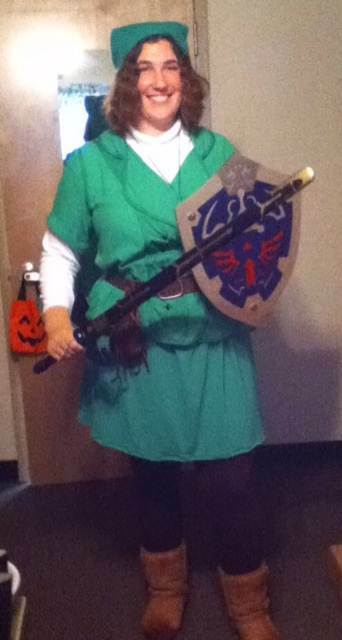 If you’re the Hero of Time in your social circle, why not dress as your video game counterpart this Halloween? 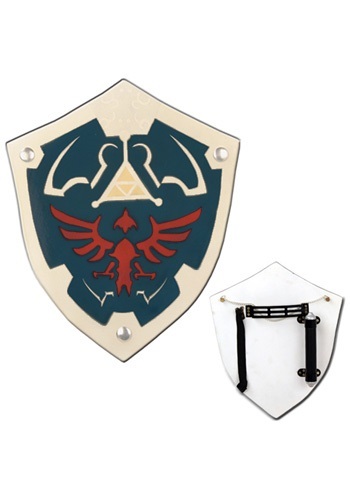 Just add this Hylian shield to your best Link costume and relive your love affair with the Legend of Zelda! You’re certain to adore this wooden shield’s print, which shows off your dedication to protecting the Triforce. Meanwhile, this accessory’s wood handle, cloth strap and chain ensure it can be toted easily to your Halloween party, then hung on your wall after the festivities. We wouldn’t be surprised if you DIY it into an alarm clock after Halloween—after all, finding this shield has inspired you to play your favorite game all over again, and you’ll want to get up an extra hour or two early to collect all those hearts so you can make it to work on time and in full health. This is an awesome shield, it's even better than it looks in the picture!! Beautifully painted with great arm holders. It was a little heavy to carry around all day, but it will look great on my wall and it's fantastic for cosplay!! ^_^ You should definitely buy this, it comes at a great price too! The shield is absolutey wonderful. It came quick and it looks marvelous. My only problem with it is the paint is a bit smeared or chipped in some places. The shield is a bit dinged up on the bottom (slight crack) and the back is chipped a bit too. Other than that its wonderful.